Indulge in peace and tranquility at this intimate island just off the coast of Riviera Maya. Discover coral reefs with crystal-clear waters, dozens of dive sites, tempting culinary delights and more. Cozumel is a diver's paradise and Chankanaab National Park, whose name means "little sea" in Mayan offers aquatic fun for the whole family. 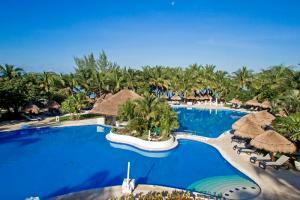 Book your Cozumel trip today! Cozumel, Mexico Our 3-Star classification designates those properties where guests experience an ideal mix of comfortable accommodations and modern amenities. Most of these hotels feature a variety of services, and offer distinguished style and comfort. Cozumel, Mexico Our 3.5-Star classification designates those properties where guests experience an ideal mix of comfortable accommodations and modern amenities. Most of these hotels feature a variety of services, and offer distinguished style and comfort. Half star indicates that the hotel/resort meets all criteria of the designated rating and exceeds in certain areas. 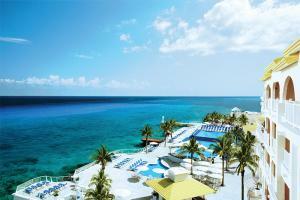 All-Inclusive - In the heart of Cozumel, bordering the famous Palancar Reef, this seaside resort offers comfortable junior suite accommodations.